Russian tycoon’s efforts to exclude public from shoreline of his mansion result in planned civil rights protests, but in true Ibiza style. Further case of wedding organisers excluding public from beach for private event. Our guide to the Ley de las Costas, Spain’s law of the coast, and how to access precise information on public areas. 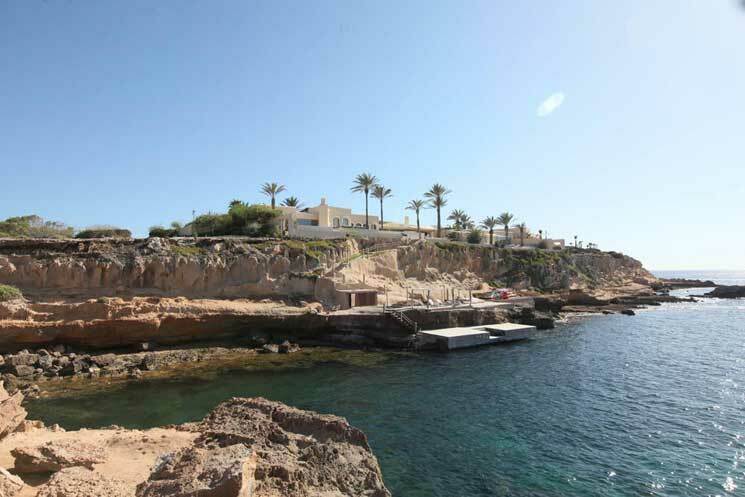 The issue of public access to Ibiza’s coastline and beaches has been a regular topic in Ibiza news this season and last. It is widely understood that Ibiza and all of Spain’s coastlines are in public ownership; however there is considerable misinformation as to the regulations in force. There are several types of situation that have been causing public outcry in what many people see as private business and landowners abusing the protected status of the coastline and the beaches for their own use. A very common complaint has been of the ever expanding sunbed concessions. It is felt by many that the many ‘beach club’ businesses catering for higher end business have had a particular effect on reducing the area of beach available for use by non-patrons. Another ever more frequently occurring situation is that of private event organisers taking over coastal areas for weddings and other private functions. We reported on this recently detailing the Balearic governments request that the public are encouraged to report any such unregulated events highlighting both the anti-social and environmentally detrimental aspects of such functions. A further type of restriction on public access which has caused isolated problems for many years is that of seafront property owners attempting to take over the shoreline for their own exclusive use and to prevent the public right of way – a right of way that must exist without exception on every centimetre of Spain’s coastline. This has caused particular outrage amongst Ibiza’s residents this week resulting in some planned events of ensuring public access rights are not lost – but in a wonderful Ibiza twist placards and demonstrations have been replaced by BBQ’s, sardines and mass swimming. It is however worthy of note that some property owners feel they have justifiable grievances for the loss of land they have experienced without compensation under Spain’s Ley de las Costas. Formentera has made the national news in this respect where seafront property owners have lost more land as a result of the coastal reforms than any other area of Spain. This is relating to land further away from the actual shoreline and so a very different situation to one where property owners are preventing access across their land. Report of the Russian mansions owner’s actions and details of the planned civil rights protests. Guide to the Ley de las Costas with details of how to access precise information on what is public land. Mari said that ‘termination should be implemented’ for the most controversial concessions, as given to a tycoon at the foot of his mansion in Playa de Comte. The Russian owned mansion has been subject of numerous complaints regarding access, measures taken to prevent access, and also the hostile attitude of the security guards. Complaints are being made on a very regular basis against the owner of the house who has ‘expanded’ his property to include a jetty and shoreline terrace. In the past few days two residents have filed complaints with the Civil Guard. One of them, who has lived in the area for many years, said that when approaching the rocks he was told he could not “sit on that land”. After a discussion with the guard about the legality of the concession, ‘the owner appeared yelling, threatening, insulting and assaulting him where he was sitting’. As a result, they had to call the Civil Guard. While waiting for the agents, “the owner of the house went on his yacht, knowing that when the police came, there would be problems.” When the agents arrived, they corroborated the right of public use to the area. A woman who arrived to the area a few days ago by yacht said that the occupants of the house ordered her to leave because she could not anchor in these waters, where they and their guests used jet skis etc. Walking Ibiza’s Toby Clarke told us of the latest technique employed by the owner. “Walking though the other day and they have now planted really prickly cactus to make it more difficult. The guy next door is also saying you can`t walk though his garden, it’s a really dangerous route you have to take“ . Councilman for Beaches and Environment of the City of Sant Jose, Pep Cardona, has stated that “this is a matter for the general direction of Costas” but confirmed that “to prevent access to the sea is illegal”. The mayor also has first-hand experience of the Platja de Comte mansion on his visit a year ago, 17th July 2015, shortly after taking up office. He was there at the request of Miguel Vericad, who had just been appointed Ibizan Minister of Environment and wished the mayor to know of “the abuse that was committed in that part of the coast”. Impromptu protests have already been held by individuals with around 15 people choosing to make use of the owners jetty to swim, and then extensively shared on social media with the slogan ‘Reclaim the Beach’ (though such things should really be left to the experts as our ’Seize the Shore’ is both catchier and technically more accurate. One planned protest event (we believe there to be others also being arranged on the same day) is this Saturday 27th 5-9pm, and organised by the group Unitat Vigilancia Eivissa through Facebook. At time of going to print approaching 500 people have expressed interest in attending the event— with the organisers posting there will be no alcohol or fire and that cleanliness and respect for the environment is first and foremost. In more Ibiza news relating to the denial of access to public land, a local resident reported the apparent ‘closure’ of the beach Ses Estaques in Santa Eulalia, with hammocks displayed as reserved so that no one could use them. The complainant also added that at 1pm they changed the area to ‘no unauthorised use’ due to a private celebration. It is not the first time that public access to this particular beach has been prevented. A restaurant-beach club in Santa Eulalia closed a stretch of coast in the area of Ses Estaques to celebrate a wedding on the 31st July. After receiving a complaint from a neighbour, local police rushed to the scene and forced the business owners responsible to remove the chairs placed in the area of coastal public domain. It was also reported in the Diario de Ibiza that those who had allegedly hired the service had paid around 10.000€ for the use of the beach. Social media can be a great source of information, but in some areas it can be more misleading than helpful. Whenever we have seen reference to the coastal law regarding the extent of public land it has always been given in a metre measurement of coastline – but that has varied from 3 to 20 metres according to the varying views of the people sharing the information. From research we have undertaken it seems that the law is nowhere near that simple. The extent of public ownership is determined by many factors, and most are not easy to assess through measurement or even the currently observable physical environment. The authoritative ‘Spanish Property Insight’ blog, by Mark Stücklin, gives a very useful guide to the Ley de Costas. Though it has been amended in some respects by legal cases of property owners objecting to its consequences to their land ownership (see Formentera article below) it can be considered as current and correct in terms of public right of way and access to the coastline. Basically there are two zones separated by a demarcation line (deslinde). The two areas are, the public domain, in which there can be no private ownership, and then a zone of 500 meters in which there are several areas and various restrictions to private ownership. The restrictions are very stringent nearer the sea but get more lenient as you get further away from the sea.. Inside that area everything is deemed to belong to the state, and any historic ownership is forfeited. However there are usage exceptions. If a property owner can prove that buildings on that portion of land are legal, and were constructed before 1988, they can apply for compensation, but only in the form of a concession to use the property for 30 years. If they cannot prove legality and age of construction it can be demolished. Even if that concession of use is granted, it can be rescinded at any time by the authorities if it is considered to be in the “public interest”. In that situation the property owner would only receive financial compensation to the value of the building construction, not the market value of the property including the plot of land it sits upon. The private area on the other side of the demarcation line (deslinde) is split into two zones, the first 100 meters is the protection zone and the next 400 meters is the zone of influence. Inside the 100 meter protection zone the only private property allowed is legal property built before 1988 and on land officially recognised as urban land in 1988 and even then it must be a minimum distance of 20 meters from the demarcation line or else it can be demolished. Within the zone of influence restrictions apply, for example, it is not allowed to build high rise properties. 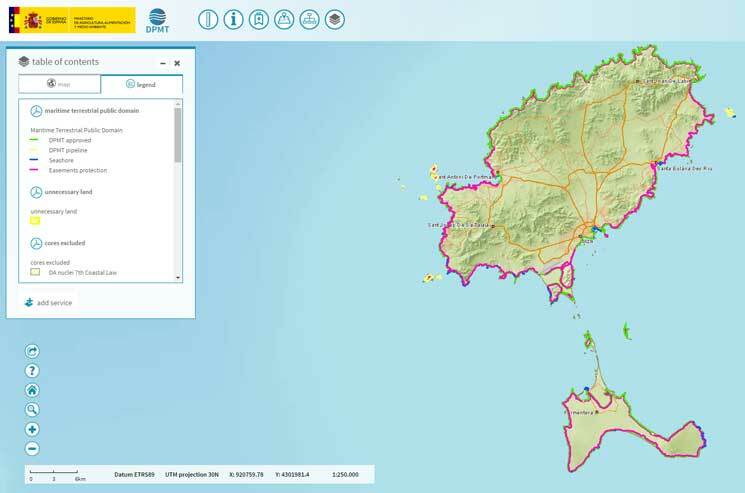 A resource on Mark’s website is the Spanish Government Map which shows the two coastal lines in incredible detail, together with property boundaries etc. 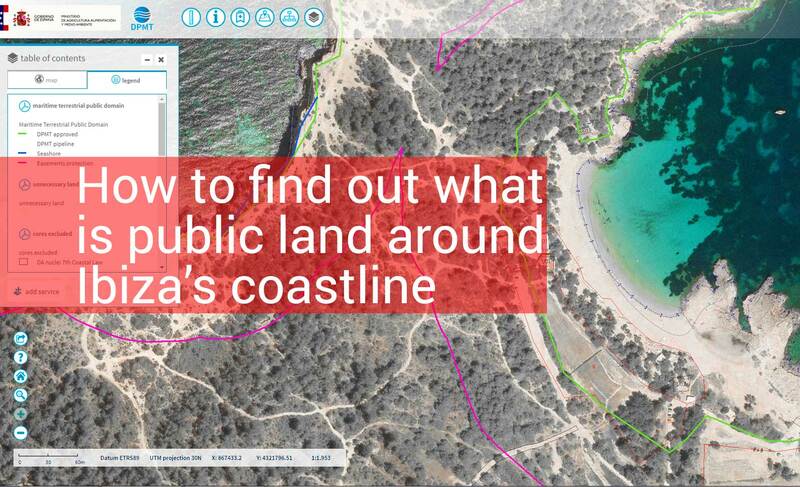 In the detailed screenshot we have shown Cala Bassa, one of the beaches that has received many complaints of private business taking over what was previously open public beach. In a big blow to many property owners on the Balearic Island of Formentera, Spain’s Constitutional Court has struck down parts of the 2013 Coastal Law reform that would have redrawn the public-private boundary on the island. In 2011 the new Government set about reforming the Spanish Ley de Costas, or Coastal Law, introduced in 1988. The reform was passed in 2013, including measures like extending concessions (for buildings) on public land from 30 to 75 years, and reducing the area of special protection inland from the waterfront from 100 to 20 metres in some areas. The reform also mandated a new boundary between public and private land for the Balearics island of Formentera, reflecting the “exceptional character” and “special geomorphologic configuration” of the island. Thanks to Formentera’s small size and coastal landscape, private property owners were hit hard by the 1988 Ley de Costas, which confiscated proportionally more private land there than anywhere else. This reform was intended to address that injustice, and return some land to private owners. But the 2013 reform was contested in the Constitutional Court by the opposition Socialist Party, supported by organisations like Greenpeace. The Court has just ruled that some elements of the reform, such as the new boundary for Formentera, are unconstitutional, and must be removed from the statute books. The Court ruled against the new public-private boundary (or deslinde in Spanish) for Formentera on the grounds that it lacks “rational justification” and objective criteria. It’s a big blow for numerous residents of Formentera, who were expecting to get their properties back, but now have concessions instead. Jaume Ferrer, President of the Formentera Island Council, described the reform as “ill advised”. He commented, “the strong wording and decisive nature of the sentence demonstrate that the previous work by the legal teams of the central government – which called into question the past divisions – were poorly prepared”. The director general of nature and biodiversity Catarina Amengual has urged people to use the 112 emergency lines to report organised events being held in protected areas. This follows complaints by a group of visitors who had tried to access the open area under the tower of Des Savinara which is considered to have one of the finest viewpoints of Es Vedra. On their approach their way was blocked by staff from the private company saying that a wedding was being held and that that area was closed. San Jose Interior councillor Paquita Ribas, has said she was unaware that prior approval of the department of environment was required to organise an event. The esplanade is used for all types of events but Amengual said that it is included in the Natura 2000 network and therefore approval is required, especially when the movement of people and vehicles is to be expected. According to the Director, the problem is widespread and though wedding celebrations are one of the more common, there are also large parties and sporting events – particularly mountain biking that are held without the necessary authorisation. She continued to say that the promoter of any such event must ask permission detailing the activity for it to be evaluated to ensure that it has no detrimental environmental impact.